Taking the learning outside can make a big difference. As the weather warms up, it can be hard to keep the attention in the classroom. The birds are chirping, trees are blossoming, and the muddy lawns are calling! So, when kids want to be nothing more than outside playing, how do you keep them focused and learning? Try taking the learning outside! 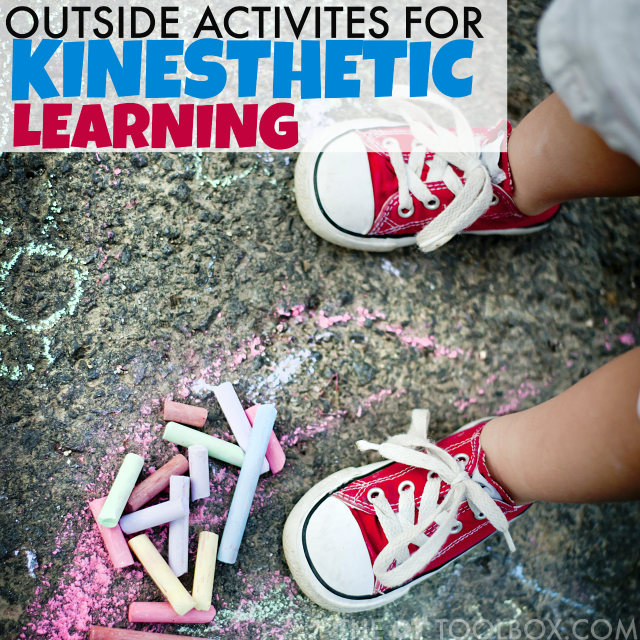 These kinesthetic learning activities are perfect for the outside play this time of year and all year long. 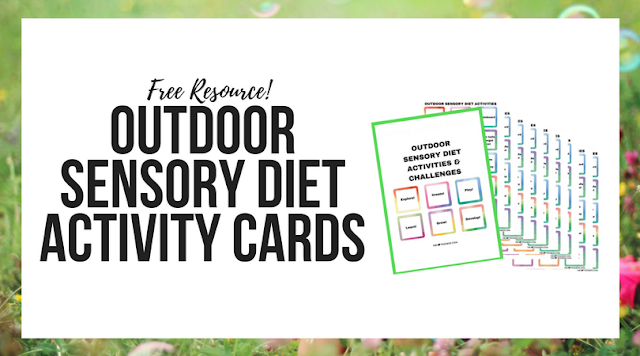 Add some movement and outdoor play and facts are sure to stick when kids are out of the classroom and outdoors! I recently shared a post on tactile learning with a sight word sensory tray. I talked a little bit about kinesthetic learning and how some kids just seek tactile input in their learning. Tactile learners and kinesthetic learners are a lot alike. Kinesthetic learners need to move their bodies, manipulate materials, and really interact with learning materials. These children tend to fidget, wiggle, slouch, or get up out of their seats when in the classroom setting. This site has a lot of great information on kinesthetic learning. Try taking the learning outside to really get some space and movement into the learning experiences. You could try these activities when practicing math facts, spelling words, vocabulary, memorization, or many other areas. Balance Beam Adventure- Use a jump rope or a board to create a balance beam maze on a driveway or sidewalk. With sidewalk chalk, draw fish in a pond. Kids can walk on the balance beam without falling into the "water". When they are on the balance beam, ask kids to hop while stating facts or other learning tasks. Try a bean bag toss game when on the balance beam. Kids can toss a bean bag into a target while spelling words. No Peeking Simon Says- Play Simon Says outside in the backyard. This version requires kids to keep their eyes closed when they perform the actions. As they play, ask them questions. You might ask them to touch their nose for "true" facts or to touch their shoulders for "false" facts. Get creative with movement and learning with this one! Backyard maze- Create a maze in the backyard by placing obstacles around the lawn. Kids can look at the simple maze and then walk with their eyes closed as another person "guides" them with verbal directions around the obstacles. Set up stations around the obstacle course where they need to answer questions. This can be as simple as a printed out sheet of questions. They just may recall the answers later by thinking about where they were in the obstacle course when they learned about those facts! This pre-reading obstacle course is perfect for kinesthetic learners. Backyard Yoga- Try yoga in the outdoors with kid-friendly yoga games like found in this book. Try having your child close their eyes during yoga moves to incorporate position of body in space. Add deep breath spelling or math facts while breathing in and out for several counts. Hopscotch Math- Practice math facts like addition or multiplication with a hopscotch game on the driveway. 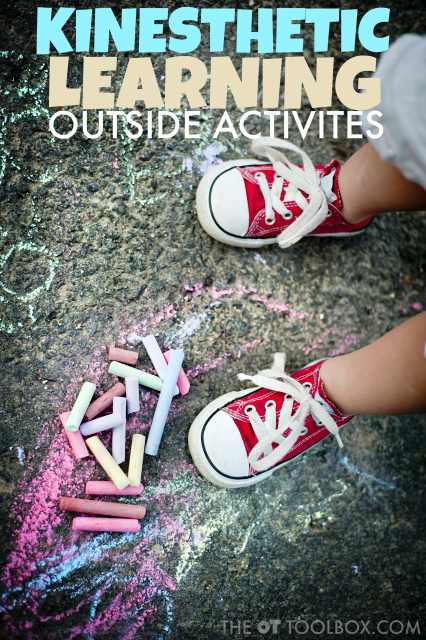 Sidewalk Chalk Learning- Kids can use sidewalk chalk in so many ways! Write out spelling words. Do math homework on the driveway. Write out vocabulary words. Use patio pads or bricks to work on perimeter, area, or geometry. What would you add? Take a Walk- Go on a stroll while reviewing information. What a great way to learn in nature! Try some of these outdoor lawn games with the kids. How can you add learning and movement to the backyard to better serve your kinesthetic learners?